Happy Friday! To celebrate, we invite you to shop the incredible savings with the Discount School Supply Single Popular Item Sale and save $3 on Colorations® Washable School Glue, Gallon! 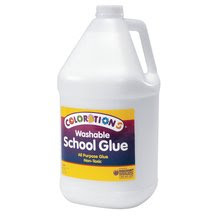 A whole gallon of glue for only $3.99! Stick to the savings and shop now to take 42% OFF the regular Discount School Supply price of $6.99! But hurry - quantities are limited! Teachers, crafters, parents and caregivers of young children, don't wait - order now! Remember to check back next Friday, too, when Discount School Supply has another popular item on sale for huge savings off of retail. What would you like to see next week? Tell us! You can find us on Twitter, on Facebook or comment here! To be the first to hear about these special TGIF single item offers, sign up for our Discount School Supply e-mails so you don't miss out on the best deals of the week! Take an Extra 20% NEW Arrivals at Discount School Supply! Attention parents and educators! Discount School Supply wants YOU to take an EXTRA 20% Off of all in-stock NEW arrivals. Choose from Arts & Crafts, Language & Music, Teacher Resources, Infant & Toddler, Active & Dramatic Play, Math, Science & Puzzles, Special Needs and faith-based items in the Inspirational Values line. With prices already so low - you won't believe the extra savings! Hurry! This sale ends July 20. Psssst....Wanna know how you can find out about even more SAVINGS? Follow Discount School Supply on Twitter to hear about exclusive savings available only to Tweeps! Plus, if you're feeling the love, become a FAN of Discount School Supply on FaceBook and reap the rewards of Fan-Only deals that will stretch your dollars even further. Summer months are perfect for Nature Investigation & Activities from Discount School Supply. My children have been having a great time discovering the tiny world of the great outdoors of our play yard with our new Magnifiers! They are the perfect size for little hand. They have a clear vision not that wavey, distorted image that makes you motion sick that you find in cheap plastic magnifiers. The yellow strings help keep the childern from dropping them. The children are having a blast while learning. I love it!" Explore hundreds of NEW products at incredible prices at Discount School Supply - SAVE up to 69% off retail! Shop categories such as: Infant & Toddler, Language, Music, Active & Dramatic Play, Inspirational Values, Carpets, Arts & Crafts, Blocks, Math, Science, Puzzles, Special Needs and more! Moms, dads, teachers and daycare providers, don't let children go bored this summer! SAVE more on everything you need to keep little ones learning (and busy) all summer long! Discount School Supply is your one-stop shop for summertime SAVINGS on learning materials, arts & crafts, and all your curriculum needs or school supplies for camp, summer school and more! When shopping at Discount School Supply, you can rest assured that you will receive top-quality products. And since our in-stock items ship within 24 hours from one of our four warehouses, you can count on receiving your order in record time! This product was excellent! I had ordered something from another company and it came in and was nothing like what I thought I had ordered. I needed something else fast for a Vacation Bible School craft. I looked online and found these and ordered that day. I received them 2 days later, which was exactly what I needed, because I was leaving town in five days to do the Vacation Bible School in another state. Worked out perfectly!"